NFPA 1405: Guide for Land-Based Fire Departments That Respond to Marine Vessel Fires 2016 ed. NFPA 1405 gives fire chiefs and commanders the information required for confident marine fire-fighting operations. 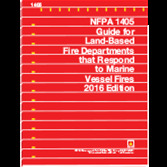 Prepare first responders to address the unique challenges of marine fire fighting, with the 2016 edition of NFPA 1405: Guide for Land-Based Fire Departments That Respond to Marine Vessel Fires. Originally developed at the request of and in cooperation with the United States Coast Guard (USCG), this vital Guide identifies the elements of a comprehensive marine fire-fighting response program for land-based fire fighters responding to fight fires on vessels. Gain the specialized knowledge your department needs to develop solid tactics and strategies. NFPA 1405 identifies the elements of a comprehensive marine fire-fighting response program including, but not limited to, vessel familiarization, training considerations, pre-fire planning, and special hazards that enable land-based fire fighters to extinguish vessel fires safely and efficiently. NFPA 1405 reflects today's fire service and the latest hazards on board vessels. This 2016 edition was revised to internationalize the terminology within the Guide.